I don’t know if you can have too many oatmeal drop cookie recipes; here is one more from the “Pillsbury Home Cooking" cook booklet. 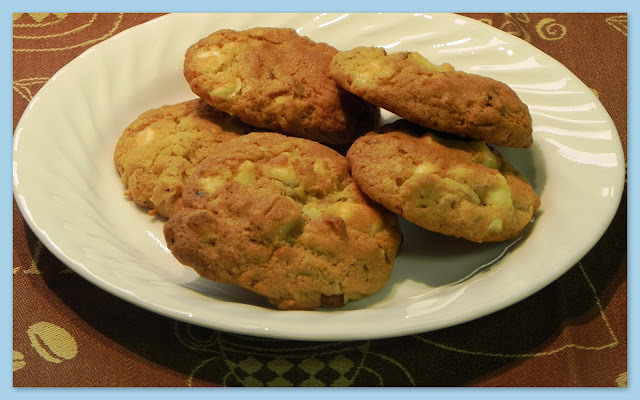 Myrna was cleaning her pantry and gave me white chocolate to use, just for this recipe – perfect. My husband, the oatmeal cookie connoisseur, gave them a “thumbs up” - in fact, he portioned them out for me. Cookies and iced tea - perfect on a hot summer day. Heat oven to 350°. In large bowl, beat shortening, sugar and brown sugar until light and fluffy. Add eggs, 1 at a time, beating well after each addition. Add vanilla; blend well. Stir in flour, baking powder, baking soda and salt, mix well. Stir in remaining ingredients. Drop by rounded tablespoonful’s (I used a size 60 scoop) 2 inches apart on an ungreased cookie sheet. (I used parchment). Bake at 350° for 10 to 15 minutes, or until light golden brown. Cool 1 minute; remove from cookie sheets. Per Serving: 112 Calories; 7g Fat (52.1% calories from fat); 1g Protein; 12g Carbohydrate; 1g Dietary Fiber; 11mg Cholesterol; 52mg Sodium. Exchanges: 1/2 Grain (Starch); 0 Lean Meat; 0 Fruit; 1 1/2 Fat; 1/2 Other Carbohydrates.